Geek Grotto - Get Your Geek On! 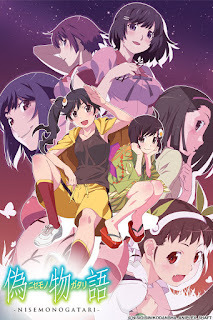 : Aniplex to release Nisemonogatari on Blu-Ray! Aniplex to release Nisemonogatari on Blu-Ray! Another title to be released by Aniplex, Nisemonogatari is the sequel to Bakemonogatari, and will be on sale on February 27th! Since I personally an not familiar with the series, I'll let the Aniplex PR handle the rest! SANTA MONICA, CA (January 24, 2013) – Recently on their live panel on their Youtube channel, Aniplex of America Inc. announced that the Nisemonogatari Limited Edition Blu-ray Box Set is set for release on February 26th, 2013 and will be available through anime distributor RightStuf.com and official retailers (http://aniplexusa.com/retailers/). The Director of Puella Magi Madoka Magica, Akiyuki Shimbou, returns to direct the critically acclaimed sequel of the hit series Bakemonogatari. Nisemonogatari continues the story of Koyomi Araragi as he further deals with more mysterious characters in his life. In addition, Koyomi Araragi’s life gets more complicated as his sisters (a.k.a. the Fire Sisters) get involved with these new characters. The Limited Edition Blu-ray box set features the entire series (11 TV episodes) on 5 Blu-ray discs, a 36-page deluxe booklet, textless openings and endings, trailer collection and more! All of the discs and bonus materials will be packaged inside a sturdy rigid box featuring key art from the series. “If you are a fan of the Monogatari series, the Nisemonogatari Blu-ray box set is a must own item for your collection” says Hideki Goto, the president of Animation Business of Aniplex of America. This release is a US and Canada Exclusive and available while supplies last. Includes all 11 Episodes on 5 Blu-ray discs: Total length of more than 275 minutes! !